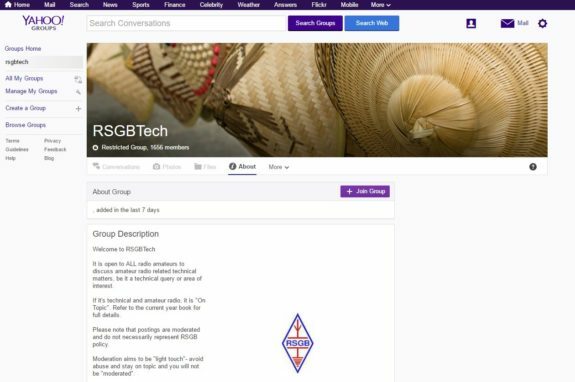 On this page, you’ll find information about RSGBTech, a Yahoo group for technical discussion about amateur radio. It’s a Yahoo discussion group, sometimes referred to as a ‘reflector’. You have to sign up via Yahoo! Groups to join, and then you can submit questions or comments either by email to the group, or via the Yahoo Groups website. The group is moderated to prevent abuse, and you can opt to receive emails as they’re received, in the form of a digest, or read the message via the Yahoo! Groups website. The group is tightly moderated to ensure that discussion is kept on topic, resulting in a pleasant, informative and generally cordial group. 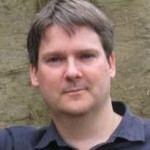 In March 2017, Essex Ham’s Chairman Pete M0PSX was removed from the RSGBTech by the moderators, despite having not posted in the group, or breached any of the group’s rules. Pete’s wife (Sarah M6PSK) has also been refused access to the group. It is understood that this is in respect of a ten-year long conflict that the moderator has been having with both an Essex-based amateur radio society and the RSGB. Pete M0PSX, a member of both of these societies, was forced to make a public statement in defence of a number of allegations that had been made against him by the RSGBTech Moderator. The assumption is that the resulting ban is out of spite – hardly in the best traditions of amateur radio! Whilst the RSGBTech Group is an excellent resource, we do not feel is is right to restrict access to amateurs and their families based solely on their club affiliation, or due to offline feuds between moderators, the RSGB and local radio societies. The group claims to be “open to ALL radio amateurs”, but if a personal vendetta is involved, it seems that’s not the case. The unfair banning, or blacklisting, of Pete & Sarah is the tip of the iceberg. There are several others who have been arbitrarily banned from joining the group, or even being allowed to read the archives of this “Technical Resource”, purportedly open to all Radio Amateur’s. Their crime was to disagree with one of the “moderators” concerned, or to take exception to his contemptible statements, such as calling anyone and everyone challenging his pronouncements “Usual Rejects”, “Failures”, “Lacking Qualifications” and more recently “Scum”. If you don’t agree with him and many don’t – you are banned and the subject for extra further abuse, including venomous abuse, from him. There is no place in a hobby that prides itself in the equality of all Radio Amateurs for this sort of divisive behaviour and it is time that the RSGB realised that it is doing the hobby, and the RSGB considerable damage. “Encourage and respect the full range of amateur activities, in all its diversity”. That clearly must include debate, even argument on subjects connected to the hobby and the freedom for radio amateurs to be allowed to disagree without sanctions. It is becoming clearer by the day that the RSGB is ignoring this issue – maybe hoping it would go away. Weasel words. The RSGB needs to stamp this issue out, if any future consultations are to be taken seriously by the membership and potential membership. The RSGB needs to 1) Stop promoting this group. 2) Revoke any permission for RSGBTech to use the RSGB in its title, by legal means if needs be. and 3) Publicly denounce the policies that have brought the moderators and the RSGB into disrepute, if the RSGB wishes to regain credibility. I can understand the need to keep some undesirables out. For example, http://www.gazetteandherald.co.uk/news/towns/chippenhamheadlines/9317744.Porn_slur_leads_to_dock/ Now, that really isn’t the sort of person one would want to meet online. IMHO (IANAL) fully vindicated my actions and defence. I had been athe subject of a vendetta by Reay since 2002, and it continues to this day. 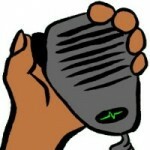 bounce up…woo hoo…what hammy mens radio is now all about…. Got to say that M0PSX sounds like a bit of a knob, from his own website…. 400 watts on a repeater. Classy. Another example of an endemic problem. G8s and G3s conspiring to make life difficult for the future generation. There are too many old guard hams out there with a penchant for pedantry and keyboard politics, intent on making life difficult for those with new ideas and approaches. The RSGB’s plans toughening entry to the hobby for non-academics highlights whose side they’re on.